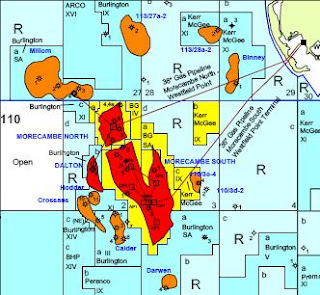 It's just a bit early to be posting on the Osama / precious metals thing, so here's a headline that - as it was intended to do - caught my eye: Centrica would like us to know that they are con- sidering shutting down one of their high profile Morecambe Bay gas fields, and all because of little George's windfall tax. I suppose it is fair for Centrica to assume that few in government have the faintest idea how oil & gas companies make these decisions. Let me assist. More importantly, the economics of terminating production permanently are quirky. As we've mentioned before, there is a chunky capital cost involved when a field is abandoned, and it is the cash-flow / accounting / tax-treatment around this outlay that determines whether or not to shut down permanently. The marginal profitability of ongoing production is largely irrelevant, to the point where sometimes it is better to keep a field going whilst making an operating loss, rather than incur the abandonment cost. George's windfall tax only affects the operating earnings (unless there is some unintended & unforeseen aspect of the small print, in which case the whole industry would be quietly lobbying to have it fixed, as always happens in such cases). It might be pointed out that the part of the Morecambe Bay area they've hinted at as a candidate for termination is just one part of a complex, the infrastructure of which would not need to be abandoned just because one reservoir is exhausted: in which case the effect mentioned above is not at work here. Fair enough: but by exactly the same reasoning, no permanent decision on abandonment is required any time soon: it becomes trivial to keep all options open. In short: this decision won't be based on the windfall tax. Perhaps the reservoir is indeed fully depleted and Centrica is just trying to spin the headlines associated with this fact to their benefit. More likely, it is simply uneconomic to produce the gas over the summer when prices are low, and they'll keep all their options open for the future, parading their shrouds for the cameras all the while. We've called Centrica here for demanding that free money be bunged their way for nuclear schemes, and here for wanting new subs to be invented for them to invest in gas storage. It's getting tiresome. Surely the best example of perverse-incentives was the recent news that wind-farms were trousering cash for shutting down production as the 'grid' couldn't take their 'lecky! Seems to me that the 'deep greens', supine politicos, trans-national power companies, Russian gas oligarchs, Al Gore and corrupt climate-change 'scientists' all have their snouts in an energy trough and tax-payers are being robbed blind. Strikes me importing more LNG now, and slowing down production in what's left of our North Sea fields is good for UK energy security. anon1 - it ought to count against them ! so: how to create a market premium reflecting security ? mandatory reserves / strategic-storage cover ? Morecombe Bay gas is Scottish. ND how the optimisation is to be achieved in a market framework Tricky. Obviously some exploitation licenses for blocks should have been held back awhile to limit production a bit. Would also have kept UK gas prices a little higher, and diminished the dash for gas in leccy production. But the politicians must have been under a huge industry lobby, and wanted early political advantage. OT on my favourite EDF/Areva topic: The Economist notes that post-Fukushima will run to Areva's short-term advantage. There will be a big increase in heavy maintenance on old nucs, as the regulators wake up. Areva will get a lot more of this work, and can probably push up profit margins a bit. Sounds very plausible. Not sure if the other Economist conclusion that EPR sales will be enhanced will pan out. But do agree with "Over the longer term, however, France.s nuclear industry faces a bleaker future." Apparently IEA have halved estimate for new nuclear upto 2036, with analysts predicting China will dominate the Gen III new nuc market. - that's no precise science I can tell you: see the history of the 1979 Gas Levy and the 1990's UK gas bubble that I have yet to write ... don't forget, gas demand doubled in the UK between 1990 and 2000, but prices didn't just fall, they collapsed - & not many economists saw that coming, so who's to devise a depletion policy, eh ? Right, so are they telling absolute porkies then? James - I had hoped that I'd offered you something a little more nuanced than that ! hmmm. Centrica haven't said they would abandon the Morecambe Bay complex; neither have they said they would abandon the North & South Morecambe bay fields. They have said that they might not reopen production from the North & South Morcambe bay field- ie just leave the wells shut in (they might need to suspend them properly, but that's still not the same as abandoning a well, and nothing to do with abandoning a platform), and buy the gas that the North & South Morecambe Bay reservoirs used to deliver on the LNG market. Then if things change (different tax laws, different gas or spot LNG prices) the wells can be reopened (perhaps a bit of work de-watering them) and away they go. They are making a point- the Chancellor's tax hike was the third such tax hike on the upstream sector in the last few years; why should gas be taxed the same as oil, when the oil and gas prices aren't really linked any more; it was an ill thought out, populist measure with no consulation at all.